As last week’s post, Creating your author blog part 1, much of this is taken from earlier posts on this subject, so if you have seen it before, thank you for stopping by, and the next post will be on sourcing content for our blog posts. Once you have your blog set up, and the catchy title picked out, etc., it’s time to start writing. Both WordPress and Blogger offer you the ability to use html (Text) if you choose, which I don’t have a clue about, or to go with the Visual (what you see is what you get). Unless you are a programmer, stay with ‘Visual. In WordPress, choose a category now for your post–do it first, so you don’t forget to do it. I published this post in the category of writing. Each blog post may have a different category, but you decide what your categories are. If you should forget to choose the category, it will go into the ‘uncategorized’ pile–the dreaded WordPress slush-pile where blogs go to die. Also in WordPress, chose a few TAGS now, if you know what you’re writing about, so that you don’t forget to tag the post. That button is below the Categories list. Chose tags that most represent the core of your post, so that searchers for that subject will find your post. 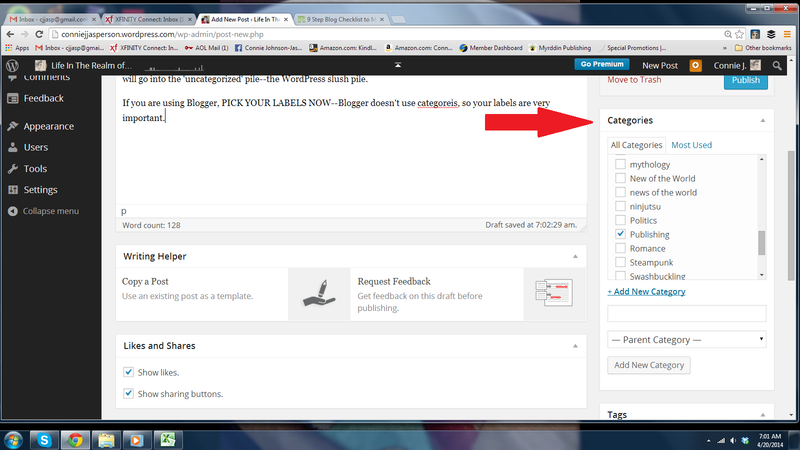 If you are using Blogger, PICK YOUR LABELS NOW–Blogger doesn’t use categories, so your labels are very important. On the right-hand side, click on ‘LABELS’ and simply type your key words into the BOX, separated by commas. In Blogger, LABELS are what TAGS are in WordPress, so use words that represent the core of what you are blogging about so that interested searcher will find your blog. Next, schedule your post: In WordPress, in the the right-hand menu-list you will open the the ‘status bar.’ Use the calendar to pick the date and set the time of day you want the post to go live. Now that you have that out-of-the-way, it’s time to blog! Hook me with that catchy blog post title! Pretend this post is called “Blogging for beginners.” Pretty boring, but hey – it is what it is. Put that title in the white box at the top of the page and DO IT NOW, so you don’t forget to give your post a title. Both Blogger and WordPress have spell check functions, and both will save at times as you go. However, spell check only picks up misspelled worlds, and doesn’t catch errors that involve correct spelling. When I key directly into the post box, some errors may get overlooked in the proofing process. I do try to correct them but I sometimes don’t notice them for several months, so blogging can be a lesson in learning to laugh at yourself. Now we want to add a picture. 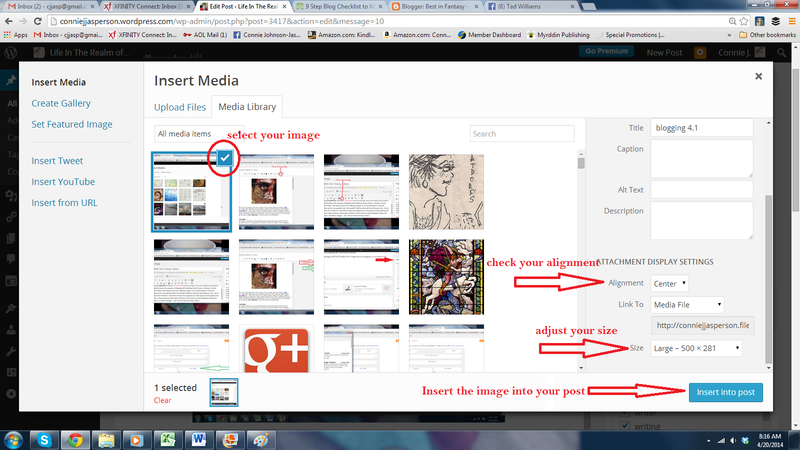 In WordPress, place your cursor in the body of the blog post and click once at the spot where you will want the image. Then scroll up to the left side of the ribbon (tool box) and click on the circle with a + sign in it, where it says ‘Add’ (when you hover your mouse over it, it will say ‘insert image.’ This symbol is a little obscure, but once you find it, you are good to go. If this is your first blog post, you won’t have anything in your media library yet, so click on “Upload Files.” Practice uploading images and inserting them, playing with it until you feel comfortable and know how to ensure the image will appear where you want it and will be the size you want it to be. Then, once the image in the body of the post you click on the picture, and a new toolbox opens. That is where you make your adjustments for positioning and size. You can even add captions if you wish. In Blogger you also click on the little picture in the ribbon (when you hover your mouse over it, it will say ‘insert image’). A pop-up menu will appear, and then you will upload the image, decide the placement and the size. This nearly foolproof simplicity is why most people who have “never done this before” like Blogger more than WordPress. All you have to do now is post your links to Twitter, Facebook, Tumbler and all other social media you can think of. It is quite easy to set up, and you rarely need to refresh those connections. This is where WordPress really excels. In WordPress, we have the “publicize” option which will automatically post to our other social sites. In the Settings menu, open “sharing” and click on it. that will take you to the “Sharing Settings” page. Click on the button that says, “Publicize Settings.” That will open a list of what I think of as blog warehouses, places that collect blogs and offer them to their regular readers. You want to activate as many of them as you can. It will take a long time for you to build up good traffic – when I began in 2011 I averaged 4 to 10 visits a day. I see those months as my training months, a time when I was able to get a feel for this craft. I have a lot more readers now because I have gained many good friends here through WordPress and am diligent about keeping this blog updated. I highly recommend blogging if you are serious about being an author, as it helps develops your writing craft, especially when you must go in and edit out your mistakes after they have posted. People expect blogs to be a little rougher than other work as it is usually written on the wing but try to do your best work—you want people to buy your books, and they won’t if your blog posts seem illiterate. As I mentioned above, my next post will discuss the nuts and bolts of sourcing content and writing the posts, including little tricks I use for catching most typos and misspelled words before my work posts. Much of this is taken from earlier posts on this subject, so if you have seen it before, thank you for stopping by, and the next post will be on creating blog posts. ‘Life in the Realm of Fantasy’ is a WordPress blog. I use WordPress because it is a free, open-source blogging tool and content management system. I also have several other blogs on Blogger (Blogspot), which is also a free, open-source blogging tool and content management system. 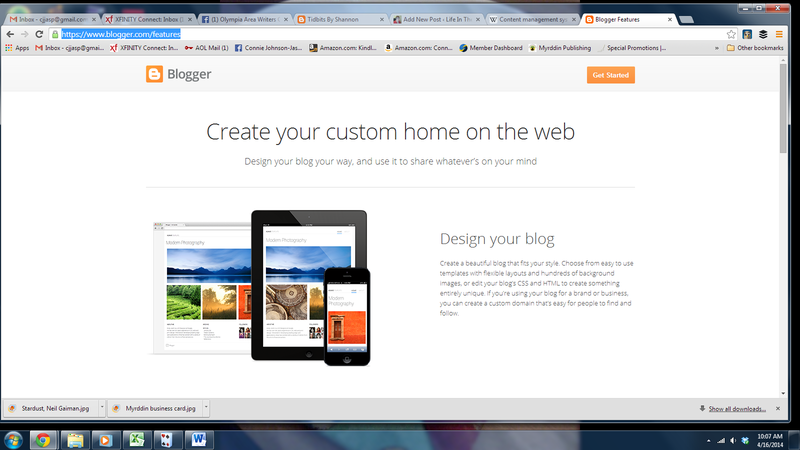 I prefer Blogger for ease of use, but it is limited. I love the way WordPress looks when you get to the finished product stage. There is a small learning curve for each. But with very few skills, I have a decent-looking blog at no cost to me, using the fine tools and templates provided by the wonderful people at WordPress or Blogspot–and you can too. The thing that is so awesome about both these products is you have the option to use them in what my husband-the-programmer calls ‘wysiwyg’ (pronounced wizzy-wig) or ‘what-you-see-is-what-you-get.’ The user does not have to know any programming or coding–all that is done for you already, and you just organize it the way you want it, within certain limitations. If you want to use WordPress visit the WordPress home pageand select the ‘Sign Up’ button to register for a WordPress account. You’ll need a valid email address (that has not been used to create another WordPress account) to sign up for a new WordPress account. Follow the steps and bam! You have a blog. But you can also do this via Blogger (blogspot), Google’s free blogging tool and content management system, also an extremely simple process. Whichever platform you choose, I suggest you use your author name. I used Connie J. Jasperson. This links your author name to your blog, which is why you are doing this in the first place. Pick a title for your blog–this one is Life in the Realm of Fantasy. I now pay something like $25.00 a year for the domain name, so https://conniejjasperson.com is mine. But for five years I used the free domain, which gives you a .wordpress.com ending after your blog name, such as http://myblogname1.wordpress.com. In WordPress, begin with finding a template. Open the left-hand menu and go to Customize and click on Themes. Select one of the many free templates. Once you find a theme that you like, you are ready to go. I use Pilcrow theme for this site because I like the versatility. 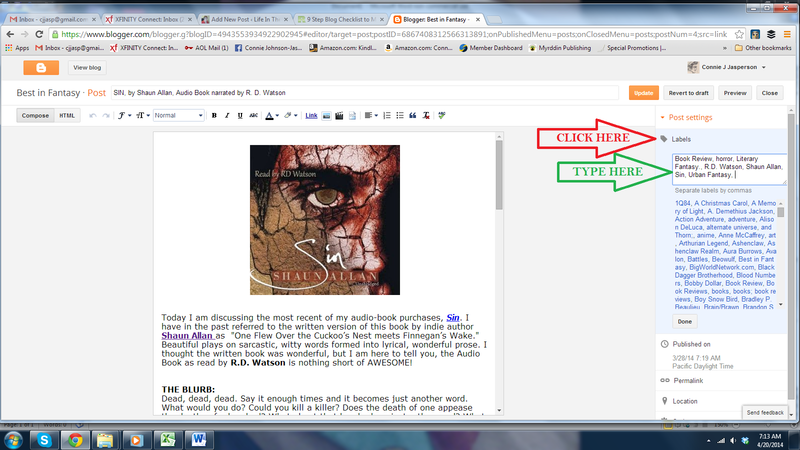 In Blogger, you will also come to a screen with many options. I suggest you just start at the top of the menu where it says template and begin playing around with it until you find the look and style you like best. You will be able to see most of your changes in the area below the Template Designer. In both WordPress and Blogger, I keep the template simple because it is easier for people to read. Once you have decided on that catchy title for your blog and have figured out the color of your fonts and background are all organized, decide the layout. You can make it one column with no sidebar, or with one or two sidebars. Sidebars are good places for advertising your books and book trailers, along with many other things you want to share with the world, such as blogs that you follow, and offers those who wish to follow your blog a place to sign up. The trick with sidebars is to keep them from junking up the blog, which I have a tendency to do. In WordPress, you will click “Upload.” This will take you to the part where you REALLY customize the look of your blog. Open the menu on the left and begin customizing from there. Click on Customize and go to Widgets. You can add your book images there, and links to amazon or other sellers, along with all sorts of other wonderful things that will make your site uniquely yours. In Blogger, click “Apply to Blog” in the upper right-hand corner. This should take you back to the Blogger page, where you will look in the menu on the left and click on the “Layout” button, just above the orange Template button. 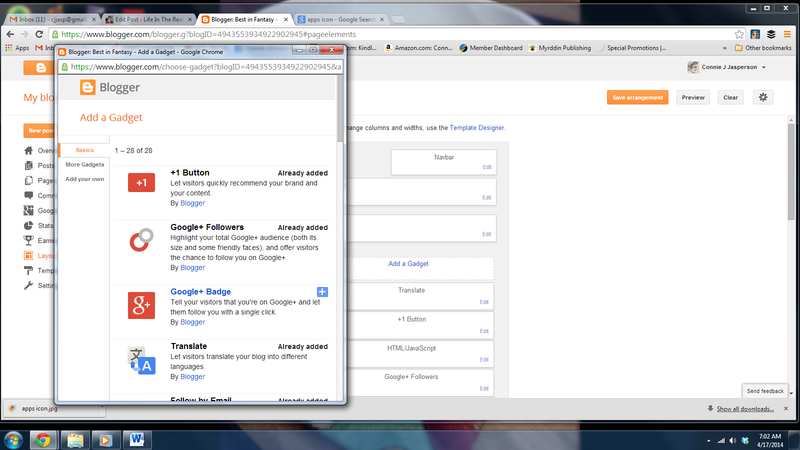 On the right hand side (yours may be different, depending on how you chose to display sidebars) click on add a gadget. In both WordPress and Blogger, you will find many options to make your site look great, from inserting images to ways to add html code for embedding videos. You can get fancy with the header or use the header they offer you. The appearance of your site will evolve over time, as mine certainly has. Both sites have awesome and informative help in their FAQs and I suggest you make good use of them. Everything I know was learned by my asking questions. Do take some time to play around with arrangements. You can preview it, but if you accidentally hit publish, don’t freak because until you add content and tell folks it’s out there, no one will see your mistakes. Take as much time as you need to get comfortable with the system and remember that anything you don’t like can be undone. 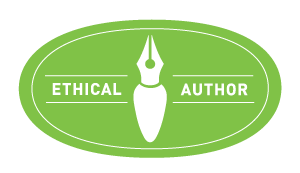 On Monday, we will begin with the actual blogging part of your author website. This is as crucial as anything else because it is where you will connect with your readers. One of the best things about being an indie author is the freedom I have regarding my writing schedule. Unfortunately, I’m someone who frequently over-commits myself, so that freedom is also a curse. Blogging regularly is part of my writing commitment. It’s a good way to connect with readers. This website is where I advertise my books, discuss the craft of writing, and talk about my life in general. I have made a personal commitment to post three times a week on this blog, plus I contribute posts to three other blogs. I do this because each time I write an essay on the craft of writing, I clarify my own thoughts on those points. Also, posting flash fiction every Friday keeps me sharp and keeps me writing little bits of prose I might otherwise not have the chance to write. I’ve mentioned this before (old people frequently repeat themselves): I first began blogging because my former publisher insisted. It was a struggle and I wasn’t good at it because those posts were pathetic attempts to write about current affairs as a journalist, something that has never interested me. For a blog to be successful, you should discuss what you are passionate about, be it travel, sports, cooking, motorcycles, books, or writing craft. What I learned from that otherwise negative experience is important: it wasn’t until I stopped trying to fit into a mold someone else had designed for me and began writing about my interests that I learned to love the craft of blogging. When I made that connection and commitment to writing about what I enjoy, I began to grow as a writer. I admit it’s a challenge. I have to work hard to proofread my own work and then publish it. When I’ve had a small success and am in danger of becoming too full of myself, blogging never fails to provide me with a sharp dose of reality. Nothing bursts your bubble of self-importance like discovering gross errors and bloopers several days after you published the post. Regularly writing blogposts has made me a “thinking” author, as well as a “pantser.” I can write using the “stream of consciousness” method, or write from an outline of whatever interests me at the time. I do the research, and the post begins to write itself. A good blogpost should have at least 500 words but not more than 1000. This means I have to keep my area of discussion narrow, and not get sidetracked. Also, flash fiction can only be up to 1000 words, so keeping it small is sometimes the issue. Writing blogposts isn’t that difficult per se, as I can knock one out in less than an hour if I’m fired up about the subject. The real challenge of blogging regularly is finding interesting content. But that is part of the challenge. The way I handle my blogging commitments is this: during the week I make a note of any interesting topic that might make a good blogpost. 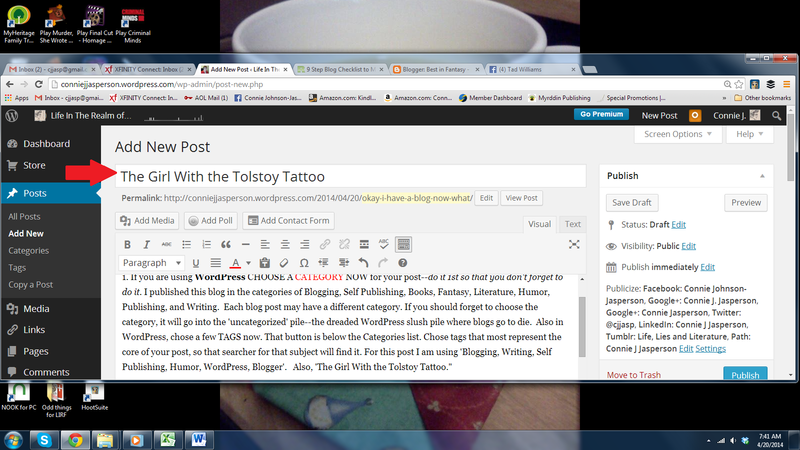 The only day I write blogposts is Sunday, but I write the entire week’s posts that day. If there is a lot of research involved I make footnotes as I go, and getting the articles ready could take the whole day. Usually writing the posts for the week only involves the morning. For a blogger who only posts once a week, it should only take an hour or so. I spell-check and self-edit my posts as well as possible. Then I go to each website, copy and paste the document into the body of the post, make any adjustments needed, add pictures, and edit the date for publishing so they are prescheduled for right publishing date. Prescheduling allows my blog to post a new article three times a week at 06:45 am my time (on a Monday, Wednesday or Friday) which is 09:45 US Eastern time. It updates without my having to babysit it. I do have to be observant when I am scheduling these things. Occasionally I accidentally hit the “publish immediately” button, which means I end up with an extra post that week whether I meant to or not. When that happens I sometimes use naughty words, such as, “Sassafras!” And “Dirty Words!” When I get done cursing, I either skip the Monday post or write an extra one. Having the ability to write each post ahead of time, edit them, and select the date for publishing allows me work the rest of the week on my true job, which is writing novels. If you are an author, you really should be blogging too. If you want to know more about getting your own blog up and running, see my post of December 14, 2015, Blogging is Writing Too. That post has screenshots and step-by-step instructions. It also talks about how to use the new default system here at WordPress so that you can insert pictures and make a nice looking post. Blogging regularly is one of the best ways to improve your writing chops but it can be like working for the circus. Even when you really know the vagaries of your platform, a lot of strange things can happen in your work. They go unnoticed, doing their thing in the background, keeping it interesting. WordPress, the mighty bastion upon which my empire rests, uses ‘fancy quotes’ as the default format. While they do look better in a document, blogging can often be an off-the-cuff thing. Straight quotes are less apt to go awry. I am not sure why this is the default, nor am I able to find a way to ‘unfancy’ them. WordPress chooses to make things fancy, but I don’t need fancy. Judging from the number of posts in their forums on the subject, I am not the only one. In some places, these curvy morsels of madness are called ‘smart quotes.’ In others, they are ‘curly.’ I don’t like them because sometimes they end up facing the wrong way, and being a bit unobservant, I don’t catch that until after I’ve posted it. I’ve discovered some out of date plug-ins that are no longer available for uncurling my curly quotes, but alas– ‘no longer available’ is not really helpful. I have a flatiron for my curly hair–I need one for WordPress’s curly quotes. Another seemingly random thing I’ve discovered the hard way: occasionally I will decide to cut a section and paste it elsewhere, only to find (after having published the post) that the cut section has magically reappeared, and I am now repeating myself, verbatim. This happens so often that I neurotically look at the menu every time I right-click-cut anything, to make sure I am actually cutting and not merely copying. I double-check the text. Yes, the cut piece is definitely cut and successfully pasted elsewhere. But when I click ‘save draft’ it magically reappears back in the place from which it was cut, and I am once again repeating myself. Then there is the hinky formatting. Sometimes the formatting goes crazy and no matter what I do, the spaces between the paragraphs vanish. My post becomes a wall of words. Highlighting the post and clicking on ‘clear formatting’ does not help. My hubby, the programmer, says this is most likely caused by some hidden formatting issue that happens when I am copying from a Word doc and pasting it into the post. I usually write my posts in a Word doc because I catch more mistakes that way. 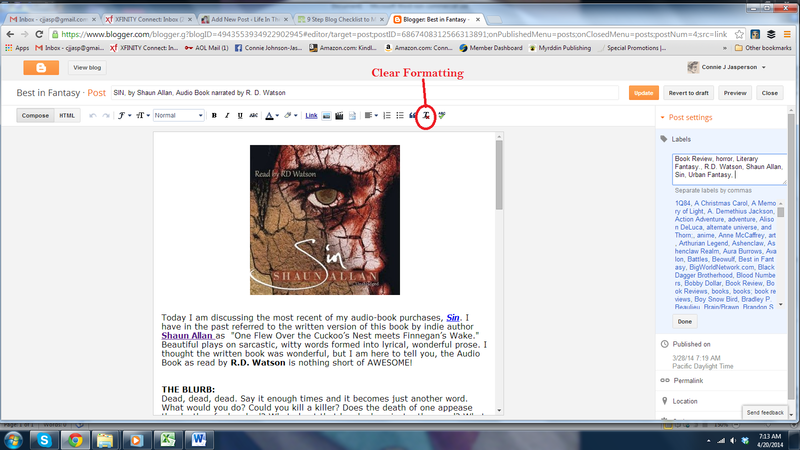 Then I paste it here and, using the ‘preview’ option, check, double-check, and check again for bloopers. Randomly, the posts are rife with strange formatting that will not be removed no matter what remedy I try. If I was a programmer, I would know exactly what bit of code was causing it and fix it. Alas! I’m only an old lady with just enough knowledge to be dangerous. Dealing with these little issues are why I try to write my posts several days in advance and schedule them for the time I want them to post. Once I have it scheduled, I will let it sit overnight and then come back and read it with fresh eyes. I catch a lot that way, but it’s amazing how many slip by me. This is why I always say self-editing is not as effective as we’d like. No one sees my blog posts before they are published but me and invariably I miss some whopping eye stopper. People wonder why I go to the trouble of blogging regularly. 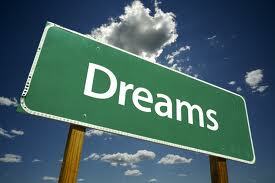 As an indie author, there is no better way for me to let the world know I am here. When a prospective reader googles my name, this blog is the first thing that comes up. WordPress’s stats tell us that over 409 million people view more than 20.3 billion pages each month. That, my friends, is a LOT of potential readers, and every time I post a blog, I tap into that pool of readers. So how do you go about getting a piece of that pie for yourself? ‘Life in the Realm of Fantasy’ is a WordPress blog, i.e. I use WordPress because it is a free, open-source blogging tool and content management system. I also have several other blogs on Blogger (Blogspot), also a free, open-source blogging tool and content management system. 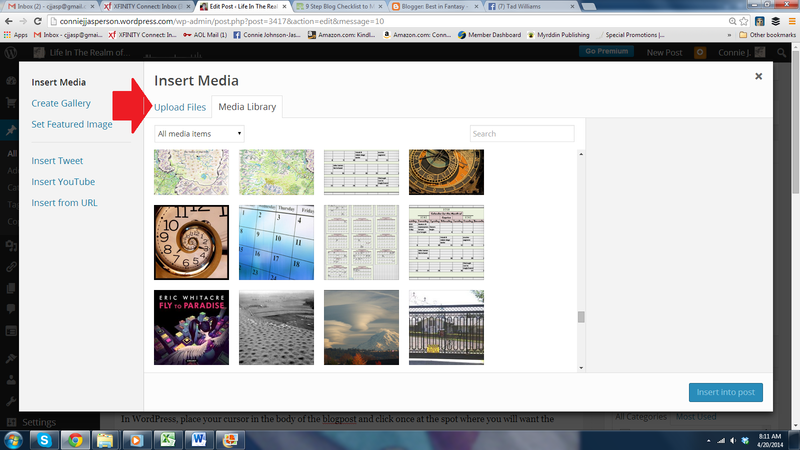 I prefer Blogger for ease of use, but I love the way WordPress looks when you get to the finished product stage. There is a small learning curve for each. But with very few skills, I have a decent-looking blog at no cost to me, using the fine tools and templates provided by the wonderful people at WordPress or Blogspot–and you can too. What you need to know is quite simple, and I’ll provide you with steps and screenshots below. If you want to use WordPress visit the WordPress home page and select the ‘Sign Up’ button to register for a WordPress account. You’ll need a valid email address (that has not been used to create another WordPress account) to sign up for a new WordPress account. Follow the steps and bam! You have a blog. I suggest you use your author name. I used Connie J. Jasperson: https://conniejjasperson.wordpress.com. This links your author name to your blog, which is why you are doing this in the first place. Pick a title for your blog–this one is Life in the Realm of Fantasy. In WordPress, choose a category now for your post–do it first so you don’t forget to do it. I published this post in the categories of Blogging, Self Publishing, Writing. Each blog post may have a different category, but you decide what your categories are. If you should forget to choose the category, it will go into the ‘uncategorized’ pile–the dreaded WordPress slush-pile where blogs go to die. Hook me with that catchy blog post title! Today’s post is called “Blogging is writing too.” Pretty boring. Put that catchy title in the White box at the top of the page, and DO IT NOW so you don’t forget to give your post a title. Both Blogger and WordPress have spell check functions, and both will save at times as you go, but spell check only picks up misspelled worlds, not other errors. Voilà! You are a blogger. It will take a long time for you to build up good traffic. Posting regularly and frequently gets you more visits and likes, which raises your visibility. This is your opportunity to write a 300 to 1000 word riff on whatever you are doing or thinking about. In my case, it is writing, and all aspects of book culture. I highly recommend blogging if you are serious about being a author, as it helps develops your writing craft, especially when you have to go in and edit out your mistakes (use the preview option). People expect blogs to be a little rougher than other work as it is usually written on the wing, but try to do your best work—you want people to buy your books, and they won’t if your blogposts seem illiterate. Your blog is up. The Template is as well laid out as you could make it. You have your books or relevant social media listed in the sidebar. You have the catchiest blog title on the block. Now all you need to do is start blogging! 1. If you are using WordPress CHOOSE A CATEGORY NOW for your post–do it 1st so that you don’t forget to do it. I published this blog in the categories of Blogging, Self Publishing, Books, Fantasy, Literature, Humor, Publishing, and Writing. Each blog post may have a different category. If you should forget to choose the category, it will go into the ‘uncategorized’ pile–the dreaded WordPress slush pile where blogs go to die. Both Blogger and WordPress have spell check functions, and both will save at times as you go, but as in everything, it is up to you to click “SAVE DRAFT” and save your work fairly frequently. 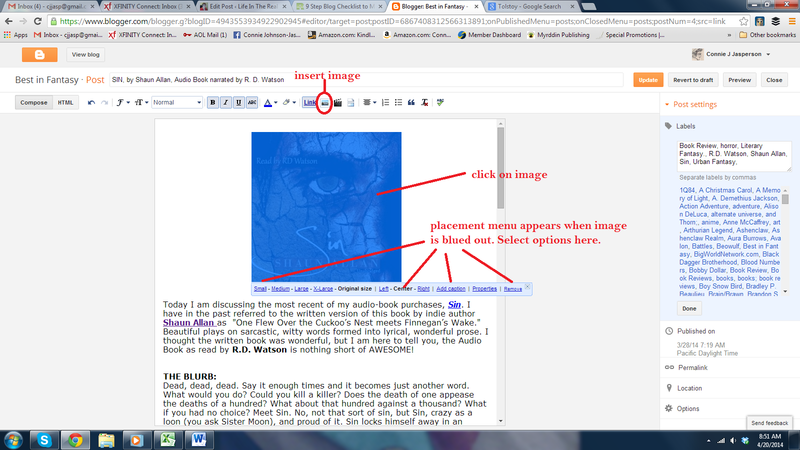 In Blogger you click on the little Picture in the ribbon (when you hover your mouse over it, it will say ‘insert image’). A pop-up menu will appear, and then you will upload the image, decide the placement and the size. This nearly foolproof simplicity is why most people who have “never done this before” like Blogger. 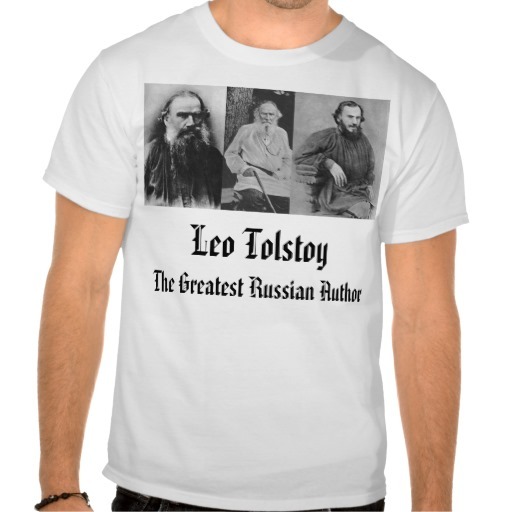 Now your picture of your Tolstoy tattoo is right there, illustrating your hilarious post where you discuss why getting that tattoo while drinking vodka shots at the “Fans of Great Russian Authors” convention wasn’t as good an idea as it seemed at the time, and that maybe the T-Shirt would have been a better investment. All you have to do now is post your links to Twitter, Facebook, Tumbler and all other social media you can think of and Voilà! You are a blogger. Do this regularly, and you will build up a following, and you will develop credibility as an author. Your name will be searchable on Google and Bing, and all other search engines. ‘Life in the Realm of Fantasy’ is a WordPress blog, i.e. I use WordPress, a free, open-source blogging tool and content management system. This means that with very few skills, I can post a decent blog at no cost to me, using the fine tools and templates provided by the wonderful people at WordPress. The thing that is so awesome about it is that it is in what my husband the programmer calls ‘wysiwyg’ (pronounced wizzy-wig) or ‘what-you-see-is-what-you-get’ so the user does not have to know any programming or coding–all that is done for you already, and you just organize it the way you want it, within certain limitations. I really enjoy WordPress, and have become quite fluent in it. But what other free and open-source content management systems are out there? 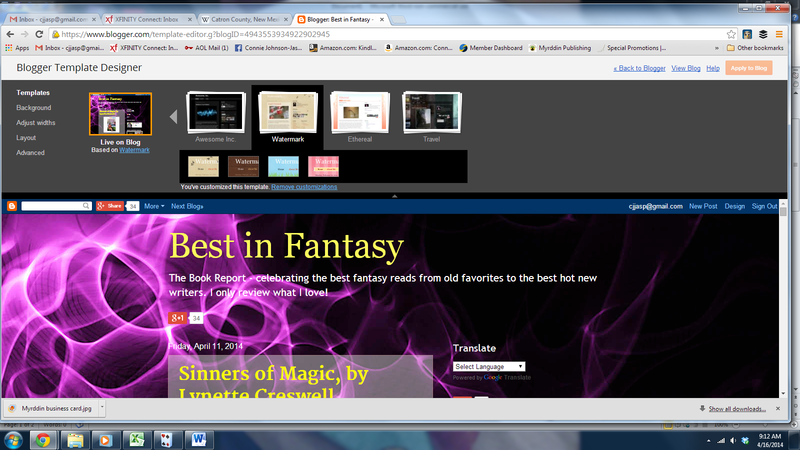 Well, I just happen to have a weekly book review blog hosted by a Google company, called Blogspot. Their tools are called Blogger, and I have become fairly adept at using that particular system too, and while it’s not as versatile as WordPress, I like it a lot. A friend of mine is new to Blogger and had some questions so I thought this would be a good topic for this blog. First you sign up for a Google account. 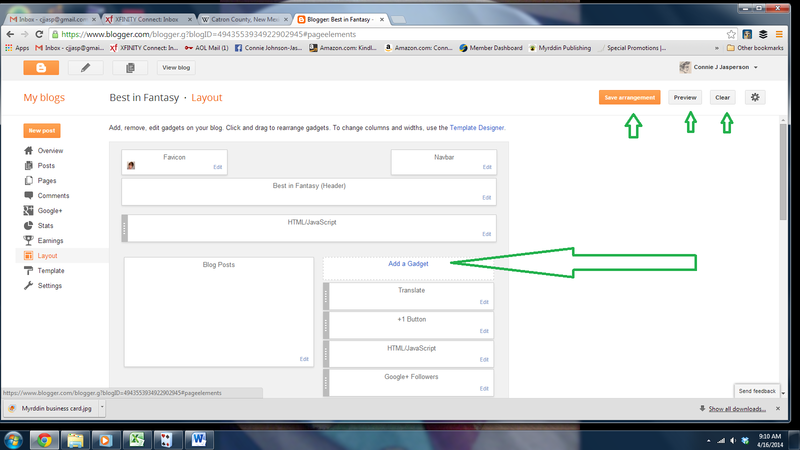 Then go to https://www.blogger.com/features and click on the orange button at the top right. Then you select the URL, or place your blog will forever be found on web searches by. So if you are an author, use your author name as the URL. This WordPress blog is my author blog, so it is https://conniejjasperson.wordpress.com. 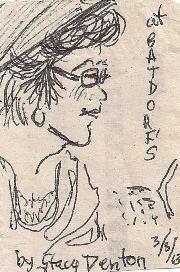 I also have a blogger address, http://conniejjasperson.blogspot.com. 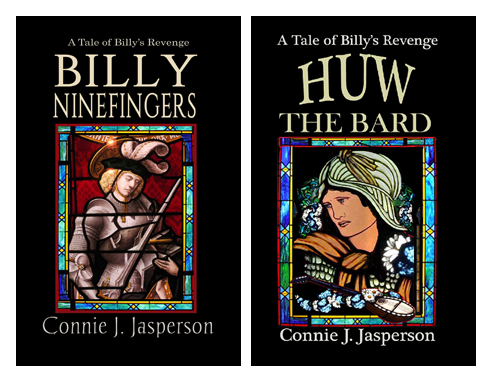 That takes readers to another book blog, Billy’s Revenge, which showcases Huw the Bard and all things pertaining to Billy’s Revenge in the world of Waldeyn. A third blogger blog is http://neveyah.blogspot.com , which is the Tower of Bones showcase. Once you have your URL selected, you can move on to building your blog. We start with choosing a template. This is a lot of fun, I think. Click on the orange “Customize” button. You will come to a screen with many options, and I suggest you just start at the top of the menu where it says template, and begin playing around with it, until you find the look and style you like best. 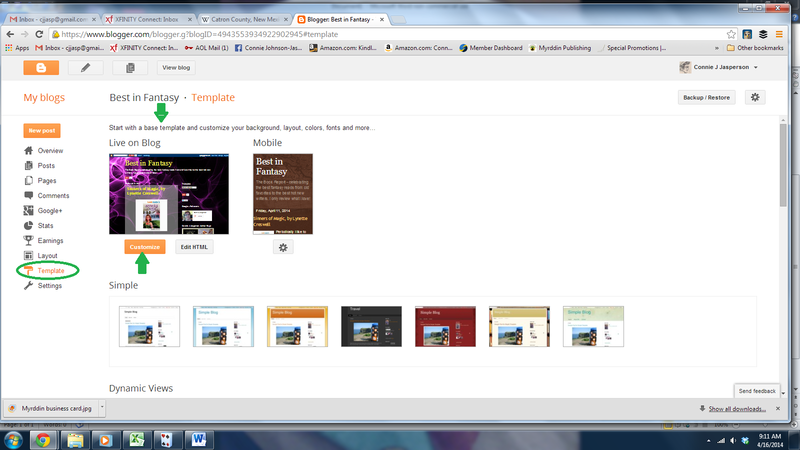 You will be able to see most of your changes in the area below the Template Designer. I pretty much keep the template simple, just because it is easier for people to read it when it is simple. Once you have decided on that catchy title for your blog, and have figured out the color of your fonts and background are all organized, decide the layout. You can make it one column with no sidebar, or with one or two side bars. Sidebars are good places for advertising your books and book trailers, along with many other things you want to share with the world, such as blogs that you follow, and gives a place for those who wish to follow your blog a place to sign up. The trick with sidebars is to keep them from junking up the blog, which I have a tendency to do. Any way, once that is done click “Apply to Blog” in the upper right-hand corner. This should take you back to the Blogger page, where you will look in the menu on the left and click on the “Layout” button, just above the orange Template button. this will take you to the part where you REALLY customize the look of your blog. There are a lot of things, from images to ways to add html code for embedding videos and things. In that regard, Blogger has a one-up on WordPress, because it is difficult to embed videos, if not impossible on template I am using, which is free–at least I’ve never found a successful way to do so. I just post the links here on this blog and hope for the best, because so far I have been unable to get any code to work. THAT is why many people prefer Blogger to WordPress, despite the fact that WordPress offers so many more templates and options. I suggest you take some time to play around with arrangements. You can click the save arrangement icon in the upper right hand corner, and then preview it, but if you accidentally hit publish, no worries– because until you add content and tell folks its out there, no one will see your mistakes. Take as long as you need to get comfortable with the system, and remember that anything you don’t like can be undone. My next post will conclude the series on ‘Blogger”, detailing how to make your post, tricks to fine tune your layout, and get the word out that you are blogging. I will also have several posts on what I have discovered about WordPress. Authors should blog even if at first they have few followers, because the act of blogging is writing on the wing–and we must write every day or we are not really serious about the craft.